Piedmont Natural Gas Downtown Alive, presented by Clemson MBA, kicks off the weekend every Thursday night with music at NOMA Square on Main Street. More than 45,000 people attend this event annually. The event serves as the single largest fundraiser for the Metropolitan Arts Council. 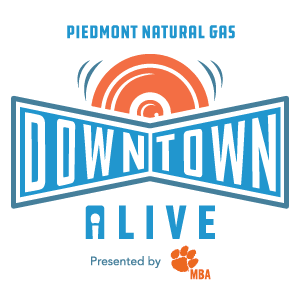 Piedmont Natural Gas Downtown Alive opens at 5:30 p.m. and closes at 8:30 p.m. Bands play two sets at 5:50 p.m. and 7:20 p.m. on the Harley-Davidson of Greenville Stage.